Access doors and panels offer a sleek and convenient way to access important equipment or valuable belongings that you do not want to leave out in the open. Check out our inventory of high-end access doors that serve a wide range of purposes. You can also count on us for great deals on roof access hatches of unsurpassed quality. Often a wall access panel is the entrance to a storage area housing electrical wiring, gas lines, and other materials that present a fire hazard. In order to safeguard these items against potential exposure to fire and heat, you should install fire-rated access panels. The specialized design of fire-rated access panels and doors ensures that the equipment within is completely protected from the transference of heat. Made from a combination of galvanized steel and insulation materials, these panels can withstand direct exposure to fire. They also have smoke-proof gasketing to keep smoke from passing through the panel and damage the equipment within. 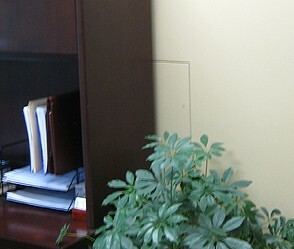 We also offer fire-rated access panels for both walls and ceilings. We also make sure the panels or doors contain all the features and properties you desire. Some of the features we can include with your wall access door include a drip cap, gasketing, masonry anchors, and customized latches. Contact us to go over all the available options for new access doors. We serve customers throughout Maryland including Annapolis, Baltimore, Columbia, Glen Burnie, and Pasadena.